Great Landscape Design: Drought Tolerant and Beautiful! Have you ever found yourself driving through a neighborhood past landscapes planted with the commonly planted lantana and oleander shrubs when you see something completely different that catches your attention? A few weeks ago, I was leaving a client’s home in North Phoenix and started on my way home, when I drove past this beautiful, drought tolerant landscape. The corner of the landscape was anchored by an ocotillo whose graceful canes added needed height to the landscape. Palo brea trees add year round green color and yellow flowers are so set appear later in spring. Globe mallow (Sphaeralcea ambigua) adds a welcome spot of orange in late winter and into spring and will bloom again in fall. Cacti and agave add great texture contrast with their unique shapes. The Argentine giant cactus (Echinopsis candicans) will produce large, lily-like flowers in spring. Several species of agave have been used throughout the landscape including Agave species americana, lophantha and victoria-reginae. With so much variety in the color and sizes available in agaves, there is one for almost any landscape situation. Several different cacti are tucked in here and there leading one to want to walk around and discover what else is growing in the garden. The thin, upright succulent stems of candelilla (Euphorbia antisyphilitica) add great texture contrast when planted next to succulents and cacti with thicker leaves/stems. The main planting area in the center is on a slightly elevated area, which offers a glimpse of the plants located toward the back. Landscape design that creates areas that artfully take center stage and then recede into the background as you walk through, which creates intrigue and heightens the desire to see what else is present in the garden. Aloes, which do best in light shade, are scattered throughout the landscape, which add color in late winter into spring. In the background, the orange, tubular flowers Mexican honeysuckle (Justicia spicigera) attracts hummingbirds all year long. Variegated agave americana adds great color contrast with their bi-colored leaves while Indian fig prickly pear (Opuntia ficus-indica) adds height in the background. I love this unusual pathway that zig-zags through the landscape. Golden barrel cacti (Echinocactus grusonii) are used to greatest effect by grouping them in 3’s. Large boulders finish the landscape adding mass and texture while not needing any pruning or water. each other for a similar effect. There are several things that I enjoyed so much about this landscape. One is how they used a large amount of different plant species without it looking ‘busy’. Also, instead of laying out the entire landscape where you can see everything from the street, this one leads you on a path of discovery when you are treated to glimpses at what is located further in. This past week was event filled along with some rather unexpected occurrences for me. One was that for the first time since early January, my calendar was quite suddenly empty. I had several landscape consultations scheduled that were cancelled at the last minute by clients and rescheduled for various reasons including a flooded house to a puppy eating a cigar. It was rather disconcerting to go from trying to keep my head above water to having the gift of extra time on my hands, but I enjoyed it and got some gardening articles finished ahead of looming deadlines. Last week was also a big milestone for my husband who turned 50. We celebrated throughout the week, but one of our favorite outings was breakfast at Joe’s Farm & Grill with our granddaughter, Lily. On a sad note, our friend, neighbor and vet passed away unexpectedly on Friday. He had treated the furry members of our family for 18 years with love and respect. We were also blessed to have been his neighbor for over 15 years. We will miss his loving care for our animals, seeing him and his wife walk their dogs in the evening and even the lemons he would leave at our door. After hearing the shocking news of his death, I had a hard time focusing on anything else this weekend and even writing took a backseat – hence the lack of blog posts. But, it was a blessing to be able to set work aside for few days and let the loss sink in. My schedule is now filled up again with appointments and the desert is awash in spring color, which is a busy time in the garden. 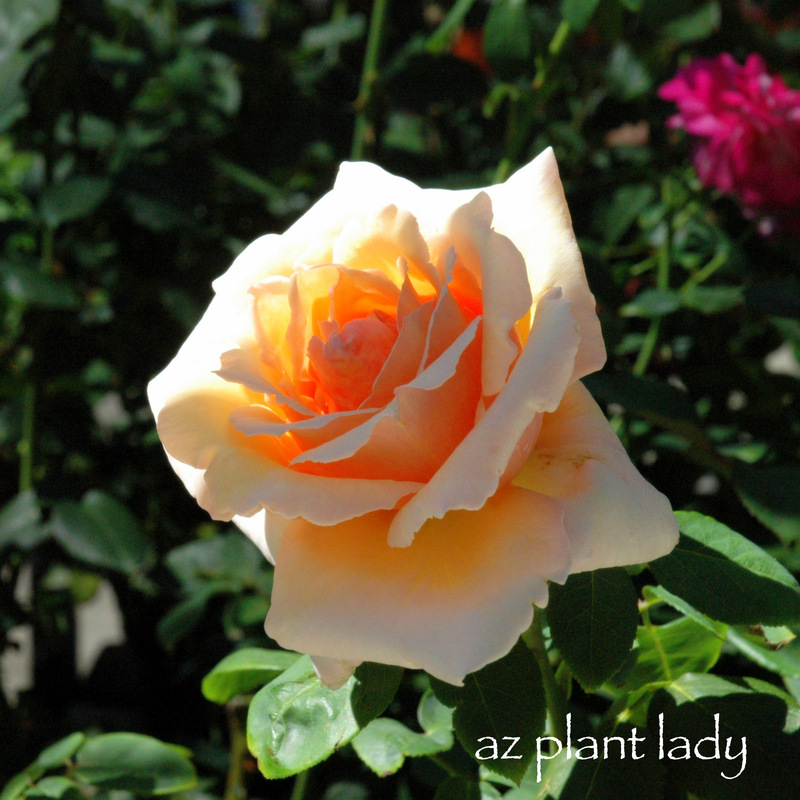 https://www.azplantlady.com/wp-content/uploads/2015/03/Beautifuldroughttolerantdesertlandscape2-1.jpg 768 1024 arizonaplantlady@gmail.com http://www.azplantlady.com/wp-content/uploads/2018/10/favicon.png arizonaplantlady@gmail.com2015-03-31 13:00:002016-10-26 14:35:38Great Landscape Design: Drought Tolerant and Beautiful! A few weeks ago, I was asked by one of my editors to come up with a list of the top 10 plants that every resident of the Southwest should consider adding to their landscape. I must admit that the task was a bit daunting at first – not because I couldn’t think of enough plants. The problem was that my list was much larger. I had to pare my list down and decided to focus on plants that would grow in zones 7 – 10, which cover much of the desert Southwest. In addition, they had to be low-maintenance, native, beautiful and easy to grow. After considering all of the criteria, I still had about 20 plants. So, I added one other criteria of my own – how easy is it to find at your local nursery? 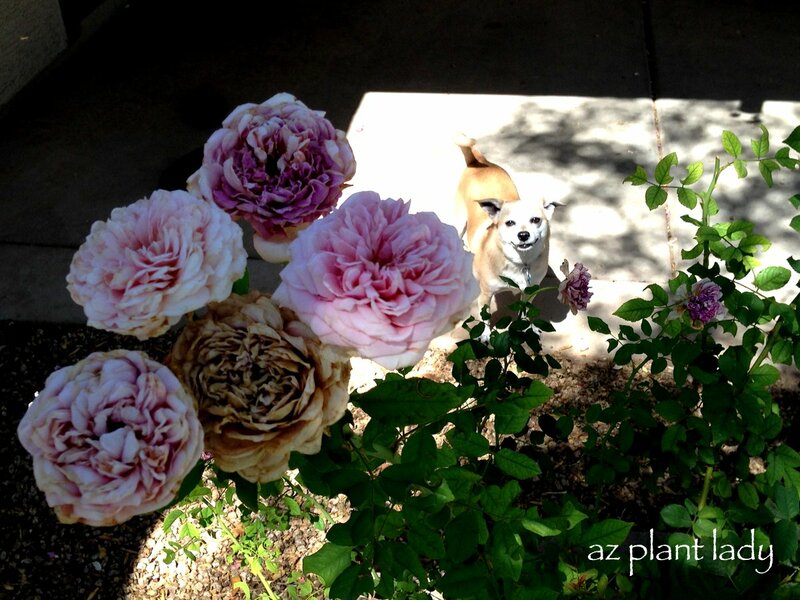 I hope you enjoy reading through this list of 10 essential plants for the desert Southwest. *I’d love to hear what plants you would include in your list of 10 favorites. June is here, which marks the official beginning of hot, dry weather throughout the southwest. While most of us can be found indoors in the comfort of air-conditioning – your plants can be suffering from the heat and intense sunlight. May and June can be some of the most difficult months for plants in the garden until the summer rains arrive in late June. Need some helpful tips for your June garden? Here is my June “to-do” list that I wrote for Houzz.com. The back wall along my backyard is covered in yellow blossoms spring through fall. Every year, I find myself pleasantly surprised that such this lovely, yellow-flowering shrub is native to southwestern deserts on into Mexico. Most of the flowering plants in my garden have a long flowering period. I tend not to waste time on plants that flower for less then 2 months. My yellow bells (Tecoma stans) provides me with beautiful, yellow, trumpet-shaped flowers spring through fall. Hummingbirds love the flowers too! What is your favorite yellow-flowering plant? Last week, was a busy one for me. I had several appointments scheduled and then I got the ‘mother’ of all colds. I don’t get sick colds very often. So, that is probably why when I do get them every few years – I get a really severe one. My constant companions the past week. I am finally among the living after a week of fighting through all that this cold could throw at me and I feel weak and drained – BUT, I can now walk through the house without carrying a box of tissues. *Being able to breathe through your nose is so delightful when it has been stopped up for a week (cold medicine just doesn’t seem to work all that well for me). Alright, enough complaining about my cold. I am excited to show you my latest project. Okay, I admit that it doesn’t look too exciting right now. As you can see, the project is on a golf course. This particular course is removing 50 acres of turf and planting drought-tolerant landscapes in their place in their attempt to save water. The area pictured above, is just one of many that I will be working on throughout the summer. Along the entire length of this area, will run a river-rock lined wash, which will help to channel storm water. I have been working on a plant palette that includes native, drought-tolerant succulents, shrubs and groundcovers that will require minimal water once established. Railroad ties, that separate homeowner properties will be removed to visually help the transition toward the golf course landscape. To that end, I will include a few of the same plants already present in the adjoining properties to create the illusion of a seamless landscape. The goal is to create a beautiful landscape area that has minimal water and maintenance requirements. To say that I am excited about working on this project, is an understatement. Interestingly, my first job out of college was working as a horticulturist for a golf course. Although I had unlimited opportunities to golf for free – I never did. Other then indulging in an occasional round of miniature golf – I don’t golf at all. I may not golf or completely understand the passion for the game – I have come to know the unique challenges that landscaping around golf courses entail – overspray from sprinklers, carts driving through landscape areas when they aren’t allowed, knowing what plants to use in areas that are in play, etc. Next time, I will share with the plant palette of drought-tolerant, natives that will be used in these areas. Who knows? You may be inspired to use some of these plants in your own landscape!